Dimensions 2 by 7 by 9.25 in. Describes Adobe's graphics applications using such tools as Dreamweaver CS3, Photoshop CS3, Fireworks CS3, Illustrator CS3, Flash CS3, Contribute CS3, and Acrobat 8. Amazon.com description: Product Description: The future looks bright for Web developers! With Adobe Creative Suite 3 Web Premium, you now have fantastic tools that enable you to create a wide array of content and graphics to deploy on a Web site that is dynamic and easy to maintain. This friendly guide doesnât just cover all the new tools in the Suite; it also offers you a primer on Web design as well as insight into how the Suite influences design. 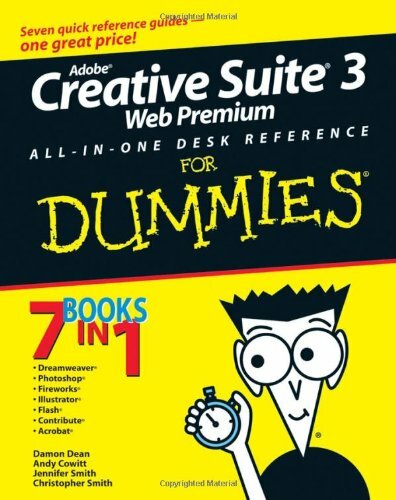 Complete with helpful hints on securing your work, Adobe Creative Suite 3 Web Premium All-in-One Desk Reference For Dummies is your one-stop guide to making the most of the Suite and developing for the Web quickly and easily!